NEW YORK - I can officially say that Terence Stamp and I once went to the movies together. Well, I went to the movies, and he sat seven rows behind me. And it was actually a series of three movies that played back to back when The Red Riding Trilogy premiered at the 47th New York Film Festival in October. Yes, The Limey and I stuck it out through all three feature-length films (a 7-hour experience) for the love of independent cinema. Personally, I also hoped there'd be an “I survived The Red Riding Trilogy Marathon” t-shirt on the way out. These films, which could also be called “Too Many Cigarettes in the 70’s and 80’s,” are adaptations of the Red Riding Quartet novels (with a cult following in England) written by David Peace. The stories are set against real-life serial murders that took place in Yorkshire, England. The movie trilogy is a great reflection of the times delivered in a beautiful film noir package, creating it’s own subgenre—Yorkshire Noir—with its own class of crooked cops, dirty businessmen, redemption-requiring heroes and the best femme fatales Northern England has to offer. 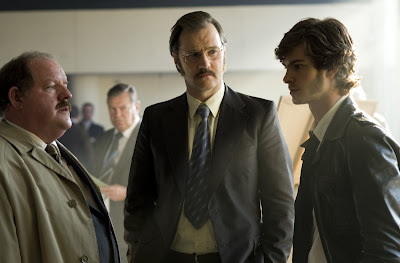 The characters are superbly acted by some of England’s top talent including Mark Addy, Sean Bean, Andrew Garfield, Rebecca Hall, David Morrissey, Peter Mullan, and Paddy Considine... well, you'd recognize them if you saw them. Each film was given a different director and each one interweaves seamlessly between a 3 year time period, within the crimes, and even the lives of the crime-stoppers themselves. In one scene, two detectives who've had an affair (a man and a woman) sit in a car as they check out a crime scene where a woman has been brutally murdered. As they discuss the crime they switch to their affair. He observes the roped-off area as he tells her how he regrets their affair and feels it was immoral. You clearly get the sense that they are framing their affair as its own metaphorical crime, a crime of passion, the slick, cool stuff of noir. I really enjoyed the first two films, 1974 and 1980. Unfortunately, as the mystery begins to get solved the last film loses some steam for me. The good news is each film stands on its own. But even with its weaknesses you may want to see the final film, 1983, just to get some closure. After the screening, the directors of the first two films, Julian Jarrold and James Marsh, answered questions along with producers Andrew Eaton and Wendy Brazington. One woman whined that the subtitles weren’t necessary. I actually agree. There were a few words that weren’t in my British vernacular, but I could have gone without the subtitles throughout. One film-student-looking guy wanted to know if the directors watched any films in particular for inspiration. After trying to dodge the question, Jarrold finally admitted to watching films like The Conversation (1974) and other conspiracy theory films of the 70s for ideas. My arm in the air was completely ignored so I didn’t get to ask about the decision to use a different format for each film. The first was shot on 16mm, the second on 35mm, and the last one with a Red One digital camera. The last film looks the most unusual, with a less polished feel. But on my way out, I did get to meet the distributor and ask him how they plan to release the films in theatres, covertly asking him if he expects people to sit for seven hours... and if they would get t-shirts. He said they are still figuring it out, but perhaps a few places will show them all in one day while others will space them out. I actually do hope that they play them all in one day. This unique movie-going experience allows for audience camaraderie and discussions during the intermission. Hopefully, your seats are as comfy as the ones at the Walter Reade Theater in New York. Click here for more posts on Red Riding. Tony, you did better than I did! Ha! You had Stamp, I had former Mayor Ed Koch sitting in th erow behind us last year at the IFC when we watched Despletchan's A CHRISTMAS TALE. I watched the RED RIDING TRILOGY at the urging of my site colleague Allan Fish, months back on a purchased Region 2 DVD set. Like you I must say I liked the first two better than the rather convoluted third, but specifically the first segemnt, 1974, was superlative. The Walter Reade is one of the city's film Meccas for sure. I was actually at the Film Forum last night to see a pretty powerful Israeli/Palistinian film -up for the foreign film oscar - AMJAMI, and tonight it's EYES WIDE OPEN, a gay-themed film about a married Hasidic Jew at the Cinema Village. In any case, RED RIDING is surely far better on the big screen, as you saw it. Giving credit where credit is due, Sam, this post was actually written by Lissette Decos. I am just catching up with RED RIDING on some screeners (courtesy of IFC Films), and hope to go further in depth on each film in some upcoming posts.